I've been here nearly 2 years and I've learned a few things (sometimes the hard way), so today I'm offering you a few tips that may speed up, clarify or simplify your process. This morning I woke up to one of my favourite emails. For those of you in Wealthy Affiliate Bootcamp you'll know exactly what this email title means: Invitation Accepted! To newcomers, it means I just got a new Wealthy Affiliate referral. What's exciting is that I do not know the person who accepted my invitation. They must have found Wealthy Affiliate via my website, possibly via my first WA review which I published a couple of weeks ago (on 30th August). Now isn't that a pip? What's also exciting to me, is that this is my 10th Referral. There has been a marked increase in referrals since I completed the first phase of Affiliate Bootcamp and published my first review. I had 6 Referrals in 18 months (6th February 2016 to 9th August 2017) and 4 Referrals so far in September. 4 Referrals have created Profiles and images so far. This ties in perfectly with WA's Converstion Rate 1 in 8. Imagine how many more referrals I would have had by now f I had done Affiliate Bootcamp in Month 1 instead of Month 19? Since I started following the Online Certification Training and Affiliate Bootcamp to the letter, my publishing rate has increased and my results have sped up. I did not have the money to invest in Jaaxy when I first got started and was a very happy user of Wealthy Affiliate's Keyword Tool (FREE to Members). 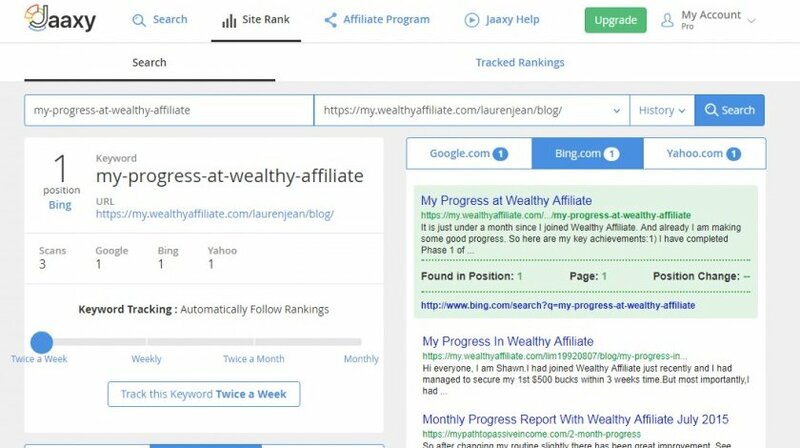 I chose the Keyword: "My Progress at Wealthy Affiliate" because it was the closest to what I wanted to say and it had 40 monthly searches and only 11 competitors (almost my sweet spot - I like to choose keywords with more than 50 searches and less than 50 QSR, the closer to 0 QSR the better). As you may know, our WA blog posts get automatically and instantly indexed by the search engines because WA is an Authority Site. (I learnt this in the TRAINING). My post is ranking No. 1 on Google, No. 1 on Bing and No. 1 on Yahoo. There a few ways to make friends here at Wealthy Affiliate. Like any business, online or offline, it takes time and effort to build your online empire. It's a learning curve. A process. Then you have to gain traffic and build a loyal following. Then you can start thinking about monetizing. Don't try to put the cart before the horse. Be careful not to compare yourself to others who are further down the track or seem to be moving faster than you. Focus on your own growth while celebrating each tiny success and milestone (as well as the success of fellow members). 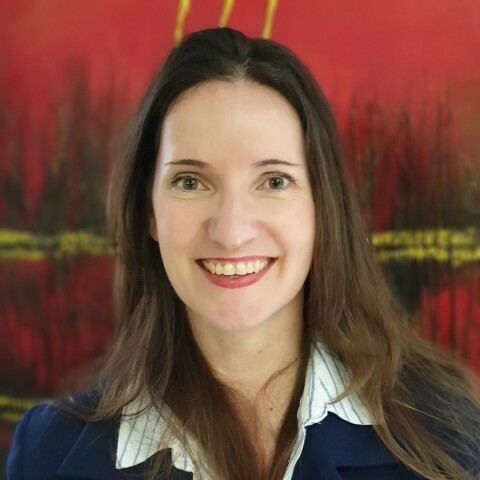 Read Lynne Huysamen's recent post for encouragement: No Need to LOOK for Income! Kyle and Carson reached the heights they've reached by having a very strong mission to HELP OTHERS. They looked for the struggles online entrepreneurs were having and solved them. One by one. How can you do this in your chosen niche? 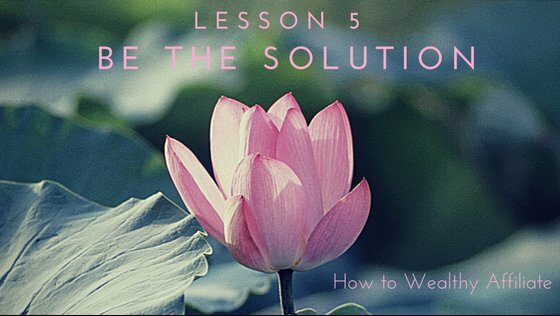 What problems or challenges can you solve? And how can you be of benefit to the Wealthy Affiliate community? Your unique personality. Your gifts and experience. How can you contribute? If success is following the example of those successful before us, which I strongly believe it is.... Follow in Kyle and Carson's footsteps. Follow their training and their shining example. Cultivate their ethos, their mission of HELPING OTHERS and you are SURE to succeed. When I look at the leaders within Wealthy Affiliate, the Ambassadors and those with very successful online businesses, I have noticed that they have the same generous spirit of giving to others. Success breeds success. Have you heard the saying: "The fish rots from the head down". Companies that fall apart, fall apart due to poor leadership. Wealthy Affiliate is the POLAR OPPOSITE of this. When the Leaders provide Excellent Leadership, the members follow suit. We are so fortunate... so blessed to be given this opportunity - the least we can do is pay it forward. I know I left stuff out. For those who've been here a while, what came up for you while you were reading this post? Were you shouting in your mind: "But she left out... and..." ? Please feel free to correct me by adding a comment below. This is a very encouraging step by step plan. It is so easy to give up when you do not see immediate results. Thanks for sharing and providing inspiration. Hi Nate, please don't give up. Stay in for the long term, it will be well worth your while. :) Happy to hear you found this inspiring and encouraging. Thank you so much for that. It's encouraging for a newbie. Fab Kari, that was exactly my intention. Lovely to meet you, now following you. Thanks for your comment, Carol. Ooh, I love how you phrased that. Well said. I think you covered it all. This should be required reading for all newbies. Its a good reminder for those of us that have been here awhile too! What a compliment! Thanks so much Debbie. You have made me want to start the Bootcamp Lauren...though I do not have a WA promotion or work from home site! I really like this post. Beautiful images, clear steps and great advice! I am glad you are one of my friends here! Oh cool, Jessica. Go for it! Am sure there are plenty of pet lovers who will enjoy WA. You could give your WA review that spin? Target your post to cat lovers who love their kitties so much they want to blog about them. Teach them how to create a niche site like yours. Just another way you are being of service to your community/audience/tribe. So glad we're friends too. Thanks for all the compliments on this post. I've noticed all the ladies are digging those flowers!! Yay! I already do that on Twitter. I appeal to all the cat/pet people to start their own pet site. It works. I get dozens of visitors each time I tweet my WA link. No premium sign ups yet though. I just meant doing Bootcamp to promote WA in general though. Thank you for taking the time to put your experiences and recommendations into print for us. Your beautiful titles for each section add warmth and colour which match your message. Thank you for your insightful reflections. Thanks so much for your enthusiastic response, Susan. So happy you enjoyed my post so much. Good old Canva! I still use the Free version and its fab. This is a really good post, step by step well explained. Thanks so much Taetske. You are always so kind. Congratulations on your referrals~I told you you can reach your goals this week!! Thanks Tammy! Going for 100 Premium referrals by year-end, must put pedal to the metal! Awesome training Lauren. It looks like spring here!! Thanks Tammi. It is almost Spring here. A great inclusive training Lauren. Well presented The flowers are a great attraction!. Thanks Michael. Appreciate your positive feedback. Great post I'm a newbie but can say that the training is imperative. By End of Sep I'll be here 3 months and nearly at the end of my Certification course. I intend to finish that by end of Sep so that I can start the Bootcamp training. There is so much to learn but as you say there is equally so much to offer others through our experiences, good or bad, with the aim of helping others succeed. One of the most beautiful posts I have ever read here at wealthy affiliate. There is a lot of caring in this post. Congratulations on your success, may it continue to grow. With your attitude I don't see how it will not grow. Aw... thanks Danielle. That is a hoooge compliment coming from you. You know how much I love your writing. Meant to tell you, I shared one of your WA blogs on social media last week. Thank you Lauren, you are so kind. This post is just brilliant. Your writing comes tops with this one. I felt so proud of you. Really I did.